Strong passwords are necessary to secure our valuable information. But 14-character random-generated passwords are a real pain, leading to high volumes of password resets as you struggle to remember them. Using Bluink Key Enterprise, you can adopt strong passwords without exposing their complexity by using your own smartphone to authenticate. Users interact with their smartphone via simple methods like fingerprint and voice while Bluink Key Enterprise handles all strong passwords behind the scenes, allowing easy access to devices and applications. Studies show that executives forget their passwords more often than any other employee. This has led to many notorious cases where executive emails have been successfully phished. Imagine unknowingly handing the keys to the kingdom to a malicious entity in such a way! Using Bluink Key Enterprise, organizations can easily adopt un-phishable secure authentication methods such as FIDO U2F (Universal Second Factor) authentication without compromising ease of use or requiring heavy IT infrastructure. Breaches happen. Just scan the news headlines and you’ll find numerous high profile examples of websites that have been hacked and databases that have been stolen. Solving the problem of too many passwords is worth doing, but turning to a public cloud password manager like LastPass means assuming they too will not one day be hacked. 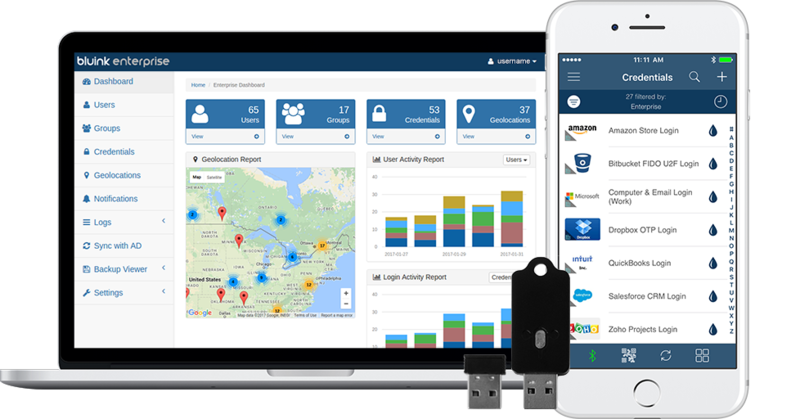 Bluink Key Enterprise solves the password problem, but never puts personally identifiable information, passwords, or secrets of any kind in the public cloud. Instead, users’ own smartphones act as secure tokens to identify and authenticate them for accessing devices and applications. Most security solutions rely on deploying software on your desktop, installing browser plug-ins, or carrying around smart cards. Bluink Key Enterprise uniquely uses your own smartphone as the means of carrying your credentials, allowing for the ultimate in portable authentication without heavy IT infrastructure. Most approaches to identity and access management rely on a centralized database of credentials, which creates a huge potential target. 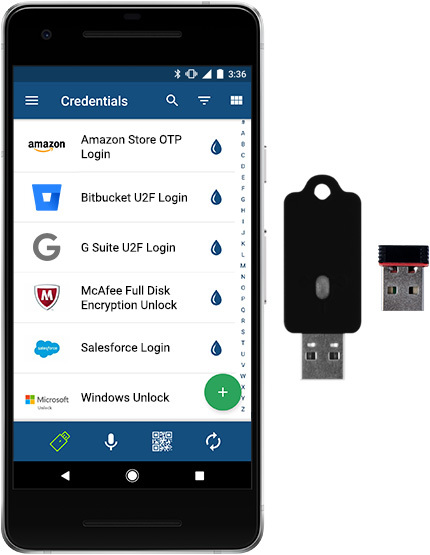 Bluink Key Enterprise pushes credentials to the very edge of the network, your own smartphone, reducing the threat of a single point of security failure. Bluink Key Enterprise's universal login goes further than any other security solution, and logs you in to everything from full disk encryption, to your OS, to your web apps. For example, one simple sign-on with your smartphone can get you into BitLocker, Windows 10, and Salesforce.com in seconds. Authentication technologies are continuously evolving and companies are reluctant to choose a solution that locks them into any single method. We designed Bluink Key Enterprise to be flexible enough to support any authentication method: strong passwords, one time passwords, public key, biometrics, multi-factor, and federation. Strong passwords are a pain. People hate using them, which leads to poor adoption, non-compliance, and vulnerability. Because Bluink Key Enterprise is incredibly easy to use, your rollout of authentication is assured high adoption across your organization. Companies have made significant investments in security infrastructure over the years. Bluink Key Enterprise works with your existing security infrastructure like Active Directory, but allows you to transition to more modern approaches over time. And because Bluink Key Enterprise is authentication-method agnostic, you are never locked into any one method. "I use Bluink Key every day... Bluink's technology is the Swiss Army Knife of authentication." "We have found Bluink Enterprise to be very useful as a privileged user password management tool."